Things that are quite harmless for adults can be a minefield of danger for someone who, at birth, will quite comfortably nestle in a space the size of your hands. Without being paranoid, you really do need to start looking for danger around every corner, and bear your baby's safety in mind through every step of the baby nursery design process. Think small and fragile. How to choose a nursery decorating style. How to choose a nursery theme. If you're having trouble choosing your baby nursery design, my 105 page nursery design guide can help. One at a time I'll take you through all the decisions you need to make in order to arrive at the best baby room design for you. With over 100 nursery pictures to help you with planning your baby room, choosing a baby room design and implementing your nursery decorating project Nursery Design Step-by-Step makes nursery decorating a breeze. Before you start with buying nursery furniture and decorating your baby's space, follow these tips to make sure that your baby nursery design is practical and easy to use when it's finished. We've all seen photos of those picture perfect designer nurseries, and they look great, I admit. But many of them just aren't practical. My baby would pull many of these places apart in five seconds flat! Essential structural nursery design factors that you need to nail down before you start decorating or adding baby furniture and gear. Wow - there's actually a baby on the way! However, in amongst all the excitement you may be feeling a mild - or not so mild - panic setting in. What if you buy the wrong crib? What if the furniture you buy won't fit in the room? What if it's too dark, too crowded, too small? If these are your concerns, follow these steps to make sure you get the right baby room furniture for you. Make sure you create harmony in your baby nursery design by following these nursery interior design tips for furniture placement. It's the best way to find the optimum furniture arrangement for your baby nursery design. Check these unique nursery furniture space saving ideas to help you save loads of space. Find out how to make the most of your nursery storage space. Make sure you have enough space for all those little baby goodies before you finalize your baby nursery design. 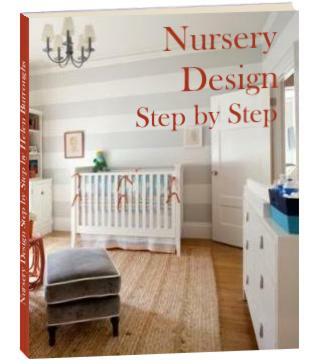 Finally, if you need more detailed help with designing your baby nursery you can download Nursery Design Step-by-Step here. Now that all the practical stuff is out of the way, it's time to move on to the fun part of baby nursery design - decorating!